made to fit loosely between the poles of a dynamo-electric machine, whose coils had been so connected that the box was placed between a north and south magnetic pole. The material of this box was free from magnetic admixture, and was supported so as not to be in contact with any part of the dynamo. In this envelope, we have not yet been able to detect any such change of density or volume as was suspected before. The cause of the momentary displacement of the interference bands which was so obvious will therefore need further examination. 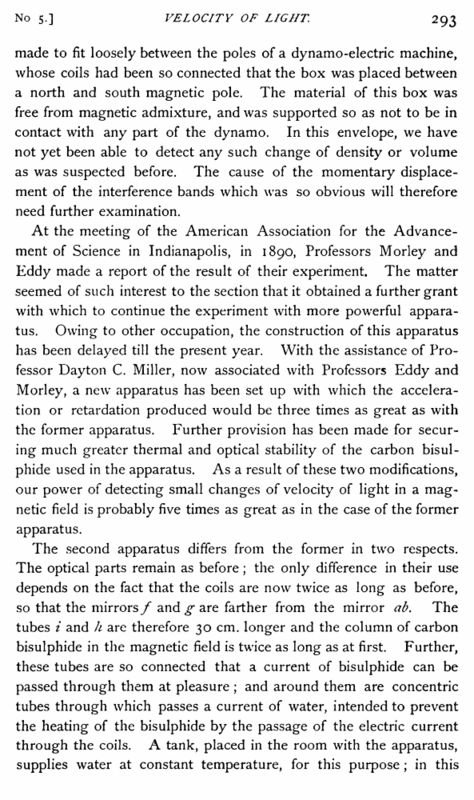 At the meeting of the American Association for the Advancement of Science in Indianapolis, in 1890, Professors Morley and Eddy made a report of the result of their experiment The matter seemed of such interest to the section that it obtained a further grant with which to continue the experiment with more powerful apparatus. Owing to other occupation, the construction of this apparatus has been delayed till the present year. With the assistance of Professor Dayton C. Miller, now associated with Professors Eddy and Morley, a new apparatus has been set up with which the acceleration or retardation produced would be three times as great as with the former apparatus. Further provision has been made for securing much greater thermal and optical stability of the carbon bisulphide used in the apparatus. 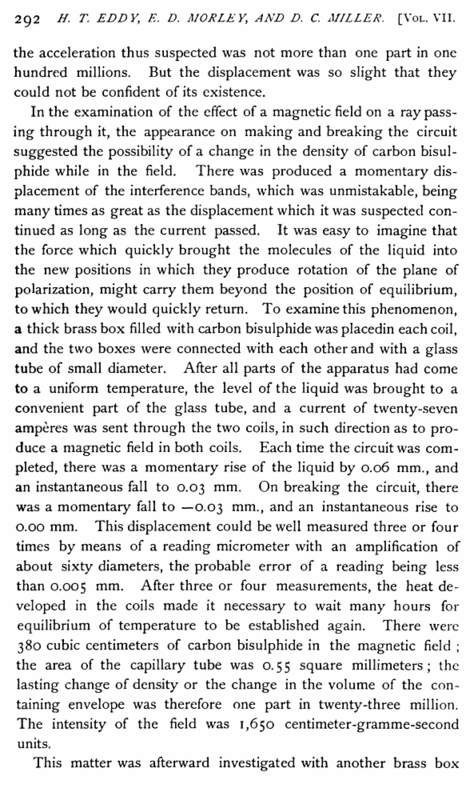 As a result of these two modifications, our power of detecting small changes of velocity of light in a magnetic field is probably five times as great as in the case of the former apparatus.